The slow start to the year continues to be slow, but at least there's some quality releases to be had. Excitebike World Race (1000pts - Nintendo) – Better late than never for this well received update to the Famicom classic. Quarth (800pts MSX - Konami) – Some gamers outside of Japan might recognise this by the name "Block Hole" which was used in both the arcades and for the excellent Gameboy port. Graphically and musically the MSX version is quite faithful to the arcade and far superior to the Famicom port. 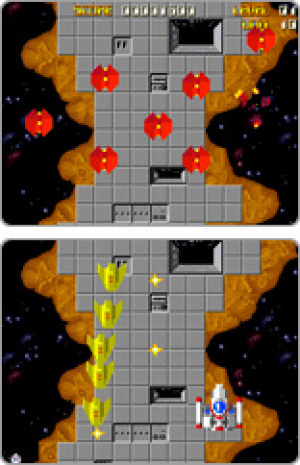 For the uninitiated, Quarth is a puzzle game in which players control a ship at the bottom of the screen, firing squares at incomplete shapes in order to clear them before they reach the bottom. Importers should definitely give this classic game a fair hearing. Upside down Star Force – what next? Contra (800pts MSX - Konami) – The MSX port doesn't look half bad, but really doesn't offer much over the Famicom/NES port beyond a lack of flickering and the ability to switch between collected weapons. Are? DS ga Sakasa Desu Kedo. Gyaku Shooting (200pts - Tecmo) – One of two new games that seem to be the start of a series of quick arcade-style games from Tecmo, which have the novel feature of being made to be played with your DSi upside down (?)! This first entry is a vertical scrolling shooter with an opening stage that looks like a direct port of the arcade classic Star Force, though later levels have a more modern appearance. If we understand the description correctly it looks like the player is using the stylus to control the attacking ships trying to kill the hero ship in the "bottom" screen? Are? DS ga Sakasa Desu Kedo. Sakasa Drops (200pts - Tecmo) – The second in the "Sakasa" series from Tecmo. This one looks like a falling block game with little space men in it. Like Gyaku Shooting it's played holding your DSi upside down so the touch screen is at the top. Potentially the goal is reversed as well and you're supposed to fill the screen rather than stop it from filling? Artist ni Narou! Minna no Nurikai Museum Hen (500pts - Ertain) – Yet another entry in the line of "colouring-book" programs from Ertain. In this one you're applying your virtual oils to five virtual canvases from Czech Art Nouveau painter Alphonse Mucha. Hobonichi Rosenzu 2010 (500pts - Nintendo) – An update to the Hobonichi Rosenzu 2009 railway map application released last January on DSiWare. Contained herein are maps for seven regional Japanese railway lines as well as subway, shinkansen, and privately run lines for those areas. Renjuku Kanji: Shoogaku 3 Nensei (500pts - I.E. Institute) – Grade 3 Kanji practice for Japanese students from our friends at I.E. Institute! I want the inverted DSiWare games. Maybe this could pave the way for Contra (NES).....hope springs eternal. Gahahaha! I want those backwards games! Is that map thing actually being released as an update and not a separate application? Perhaps this is the reason Contra NES hasn't been released yet. Hopefully MSX will find its way over here. @WarioFan83: It's got a separate listing so it's a standalone app; not sure if people who bought the 2009 one get a discount or what. I mean "update" in the sense that there was an earlier one which this one supercedes. "Gamers outside of Japan might recognise this by the name "Block Hole" which was used in both the arcades and for the excellent Gameboy port." Not entirely true. The European name of the GB port was Quarth, just like in Japan. I'm bit of a MSX-fan, but saying "(Contra's)MSX port isn't half bad" is misleading. Its true, that it isn't half bad, for it is wholly bad. Ok, no flickering, but also no scrolling! Animation is awkward both visually and gameplay-wice. 800 points is something i'd pay for Hideo Kojimas games and my favourite MSX-masterpiece, Maze of Galious, but MSX games released thus far are significantly inferior to other 8-bit games. yeah wtf inverted DSiware...I'm surprised the touch-screen-at-the-top thing hasn't been used before. Color me intrigued. I can't wait till next friday. Excitebike for me. Quarth. What an interesting nomenclature. I should probably look into the Game Boy Pocket port. 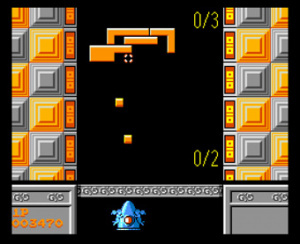 Quarth was also released under the horrendously generic name "Block Game" on Konami GB Classics. Quarth is THE. BEST. PUZZLER. EVER. No kidding. The crossbreed between tetris & shoot ém up is brilliant, and it has a great soundtrack as well as a variety of vs and co-op modes. Co-op is a blast. Yeah, Quarth sounds like its a great game and the two 200 pointer dsiwares sound great too. Oooh, they're doing MSX games now! Maze of Galious is probably still the one game I've played the most hours in my life. I'd love to play through it once more on the Virtual Console! MSX games have been on VC in Japan for awhile now, but it's only recently that it's been getting more attention. Definitely getting Quarth tonight, it's a great game and the soundtrack is indeed smashing. If you can play Gameboy games the Gameboy version is very good, I can remember spending a lot of time with it back when I had my original fat GB.